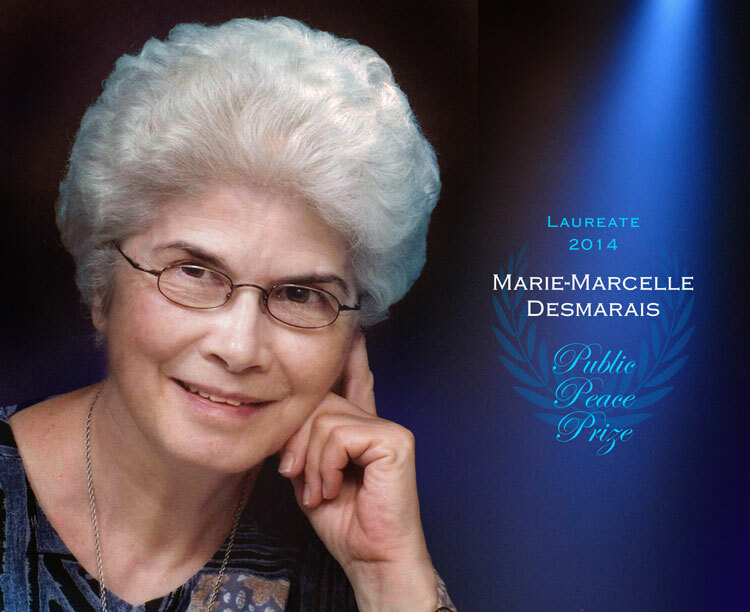 Marie Marcelle Desmarais is a woman who is a catalyst and a focal point around whom many people gravitate in search of training that will prepare them to help teach others to become “builders of bridges for peace” in the midst of differences. Thanks to her, leaders of many countries are committed to working for peace. Her “Builders of bridges for peace” and “First-aid workers for peace” training sessions were created by a woman who blends scientific precision with the sensitivity of love, combining her caring attention towards everyone she meets with her capacity to propose, stimulate, and support group initiatives in a social commitment for peace. How does Marie Marcelle Desmarais manage to get so many people involved in the same vision? She succeeds thanks to her dynamic way of transmitting values that touch and incite people to join her in becoming agents of social change for peace. It is not only because she is skilled in communication and in giving and receiving trust that we get carried away by her “fire” but, also, because she knows how to touch the minds and hearts of people capable of openness and leadership when faced with the urgent needs that surround them. The history of her relationships is woven into an entire web of people who become capable, in turn, of communicating this fire. Born in Montreal, Marie Marcelle Desmarais, CND, MSS, has been the director of an international center, the IFHIM (Institut de formation humaine intégrale de Montréal), or the Institute of Integral Human Formation of Montreal, since 1984, where she has been a leader in research and training. In 1968, “so that all may start out with equal opportunities”, she co-founded La Relance (Fresh Start) in a less fortunate area of Montreal. She worked for eight years supporting the psychological and social educational development of children, adolescents, and parents and received the “Georges Perras” award in 1997 for founding La Relance. Because of her social involvement and her commitment to the community, she was a finalist for the Quebec YMCA Peace Medal in 2011 and 2012 in the category of “Peace Volunteer”. In the context of September 11, 2001, when the world found itself in chaos and there was an urgent need for peace, the initial experiences of the “builders of bridges for peace” became a priority for Marie Marcelle Desmarais and the team at IFHIM. Becoming a “builder of bridges for peace” requires an involved process. When we say that people become “whole” again or “get back on their feet”, it doesn’t just mean that they find meaning in life again; it also means that they have become capable of removing the barriers within, barriers of racism and of all that can spark hostility toward people and things in their surroundings in order to become “builders of bridges” between people, and, “builders of peace” in the midst of all kinds of differences. 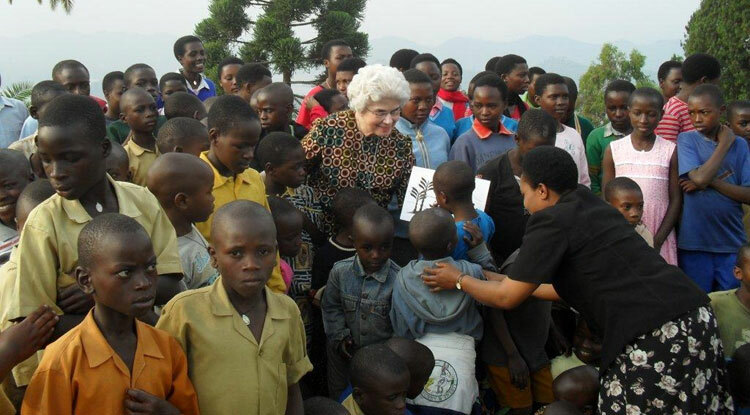 Marie Marcelle Desmarais encourages and supports the initiatives of former students who are teaching children to become “little builders of bridges for peace” in Rwanda, Lebanon, Congo, and elsewhere. Text inspired by an article written by Claire Hamel, “A Catalyst, a Leader, Marie Marcelle Desmarais”, Magazine of the Person, Montreal, IFHIM, vol.4, no.1 (September 2004), p.6-7. As a leader, she has initiated several international projects: following the genocide in Rwanda (1994), she put together the project Support for the Reconstruction of Persons between 1994 and 1996; following the earthquake in Cashmere, Pakistan in October 2005, she created a project of humanitarian aid called SOS Cashmere-Pakistan, $2 for the forgotten in the mountains which resulted in collecting $161,575 (Canadian dollars), and involving 55,000 people from 40 different countries. After the hurricanes of August-September 2008 and the earthquake of January 12th 2010 in Haiti, she implemented SOS IFHIM-Haiti, training and accompanying caravans of students capable of helping people within Haiti itself as well as Haitian refugees in Montreal in 2010. She does not hesitate to respond to appeals from countries with serious challenges, even under violent, life-threatening conditions. In these contexts, Marie Marcelle Desmarais sees the urgency of forming “builders of bridges for peace”. She is aware that these people cannot get out of this cycle of violence without a experiencing a personal transformation. She wants to help people move from hostility to openness, from fear to trust. In order to do this, she creates conditions within which people can build bridges between themselves above and beyond their differences: people from Congo/from Rwanda, poor/rich, Christian/Muslim, different ethnic groups, etc. To date (March 2014) she has undertaken 163 trips in 39 countries and every continent, having offered no less than 242 sessions, seminars and conferences. Her originality lies in an inner “fire” that pushes her to go out in search of “multipliers”, making an appeal to them, recognizing their contributions, and gathering them together in a concerted and strategic effort to respond to the urgent needs of our society, they themselves becoming agents of change. Her scientific mind and clinical judgment, joined with her charism for travelling and her remarkable gift of communication are at the origin of her scientific discoveries. Through her exceptional gifts, Marie Marcelle is a natural leader who has initiated national and international networking. She has multiplied her commitment to peace in different regions of Quebec: from the Bas-St-Laurent to the north coast among First Nation peoples. She was involved in Rwanda shortly after the genocide and in Peru at the time of the terrorism there and in the years afterwards. In Honduras in 1990, she worked with a group of officers in charge of an army battalion. More recently, she didn’t hesitate to enter the camps welcoming Syrian refugees in Lebanon and she also answered requests from Egypt to build bridges for peace between Muslims and Christians. Invited to a conference in Belgium at the University of Louvain in 1995, as a speaker, Marie Marcelle Desmarais presented “how to help people overcome their traumas” as part of a workshop on Rwanda organized by Caritas Internationalis and the CIDSE (International Cooperation for Development and Solidarity). Jean Marie Destree, then director of the Emergency Service of Catholic Relief of France, recognized in her contribution a new form of humanitarian aid. Invited to the Comillas Pontifical University in Madrid in 2000, she presented “The restoration of vital human strengths in a traumatic experience” as part of their days of study on “Psychological Intervention in Humanitarian Crises”. Invited in 2012 to the Our Lady of Port au Prince University in Haiti, for a symposium on “Spirituality, Psychotherapy, and Ecology in Haiti”, trans-disciplinary perspectives of therapeutic interventions and healing, she presented human training according to the realization of vital human strengths. She has published about 20 articles in more than twelve magazines in addition to texts written (73) in the publications of IFHIM. It takes a great fire within oneself to want to build bridges for peace. Without true love, you won’t make it. the decision to consider the riches of the other person, despite his or her limits and above and beyond differences.